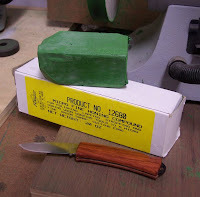 When I came across a quick way to sharpen (technically, hone) knives a few months ago, I said to my dad, "Dad, give me all your knives and I'll sharpen them for you." Question: Why do old dudes have so many knives? 40 (that's FORTY) knives, which is what Dad gave me, seems a little excessive. I'm pretty sure I only gave him like three knives total for all his birthdays and Christmases. Good thing this sharpening system is speedy. 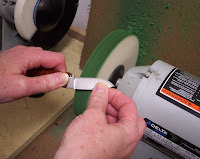 Using a 3/4" hard felt wheel, charged with a honing compound, and secured on a grinder*, will put a razor edge on your knife, provided the knife is not too dull. If your knife has a blunt edge, you'll need to spend a little time with sharpening stones first. Remember that when using a felt wheel, the direction of rotation must be turning away from you—the opposite direction when using grinding wheels. You will have to turn your grinder around so the switch is on the opposite side. If you do not do it this way, the felt wheel will grab the knife out of your hand and you could easily be hurt. Also remember to wear a face mask whenever you use a grinder and make sure that both wheels on your grinder are the same weight, so it is properly balanced. 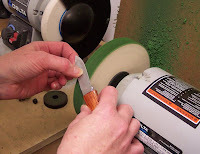 On the other arbor of this particular grinder is another 3/4" felt wheel. It doesn't take much to hone the blade this way and if you hold it too long on the wh eel, it will get hot, so check your progress frequently. I sharpened each knife in 20-30 seconds. During sharpening, the felt will turn black. That's steel, and it means you need to charge the wheel with more compound. After a while, the compound may become glazed over. To remove it, I hold a block of wood against the wheel as it's rotating. The wood effectively scrapes off the compound and you can charge it with new. The last photo shows my entire collection of knives. I have a ways to go to reach a total of forty, but then, I have a few more birthdays and Christmases until I'm an old dudette.